Electroporation of skeletal muscle after injection of naked DNA was shown by others to increase transgene expression. Information regarding tissue damage caused by electroporation is conflicting. It is also not well known how plasmid electroporation compares with transfection by adenoviral vectors. To investigate these questions the most used protocol for muscle electroporation was used, i.e. 8 pulses of 200 V/cm and 20 ms at a frequency of 1 Hz. Intra-muscular DNA transfer of pLuciferase was increased by 2 logs after electroporation, confirming data described by others. However, the blood levels of the encoded protein were still lower than those obtained after injection of first generation adenoviral vectors. Also, the electroporation procedure, on its own, caused severe muscle damage consisting of rhabdomyolysis and infiltration, whereas the adenoviral vectors caused only a slight infiltration. As damage of targeted tissue may be an advantage in the case of tumour transfection, we also compared the two transfection methods in tumour tissue. In case of poorly permissive tumours, adenoviral vectors cannot transfect more than 2% of the tumour tissue without inducing significant liver damage. In contrast, the electroporation seems to offer a wider therapeutic window since it does not cause any systemic toxicity and still induce's significant transfection. 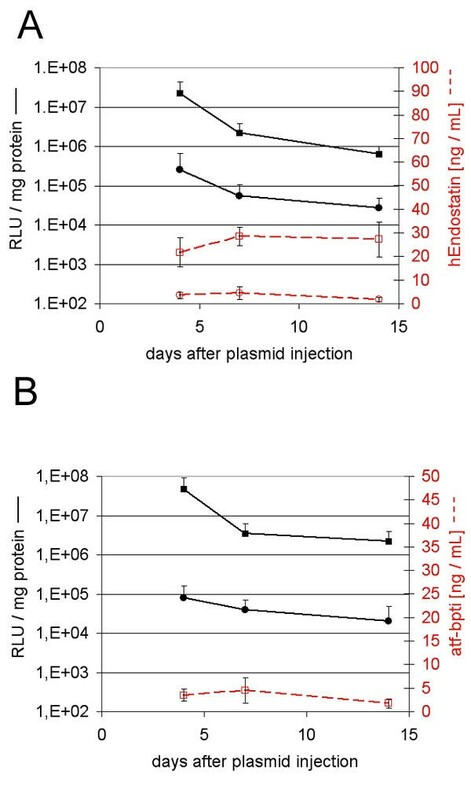 Plasmid electroporation of the muscle induce severe local damage and is of no advantage over adenoviral vectors for obtaining high blood levels of a vector encoded protein. In contrast, electroporation of tumours might be safer than adenoviral gene transfer. Numerous diseases require treatment by systemic delivery of a therapeutic protein. Repetitive or continuous injections are the only delivery method used in daily practice. As a mean of reducing the inconvenience of multiple injections or implantation of mini pumps, gene transfer technology may offer certain advantages. In order to achieve a high plasma concentration, whatever the vector used, the transfection of a large tissue mass is required (e.g. liver or muscle). In rodents, intravenous injection of a non-targeted vector – viruses or plasmid preparations – induces mainly transfection in the liver and the spleen [1, 2]. As of today, transfection of other large organs by viral vectors has not been accomplished in by way of systemic delivery . The main inconveniences of intravenous administration of first generation adenoviral vectors are their immunogenicity  and hepatic toxicity [5, 6]. The muscle as a large tissue mass is a candidate for production of recombinant protein, but the transfection is limited to the injection site. Intra muscular administration is an attractive option as it avoids liver damage, but the levels reached are not satisfactory . An alternative to transfection with adenoviral vector is the injection of naked DNA into the muscle followed by electroporation. The electroporation setting that induced high blood levels of excreted encoded proteins were defined by Bettan et al. and Mir et al. [9, 10]. This setting of 8 pulses of 20 ms and 200 V/cm at a frequency of 1 Hz increased the plasmid expression up to 2 logs in the C57Bl/6 mice. In this study, first generation adenovirus transfection and plasmid electroporation of the muscle were compared to determine which one is the most suitable for obtaining high plasma levels of two proteins of interest, namely: mhATF-BPTI and endostatin. mhATF-BPTI is a newly designed chimeric protein that has angiostatic properties and endostatin is an angiostatic undergoing clinical trials that was used for comparison. As these two proteins are interfering with tissue healing, the luciferase gene was used to study the local tissue damage caused by the two transfection methods. Another application of electroporation is the transfection of tumours. Human as well as rodent tumours vary greatly in expressing the surface receptors for adenovirus. Consequently, the gene transfer with adenoviral vectors is very low in tumours that poorly express those receptors. Plasmid DNA alone is not very efficient transfectant, therefore the electroporation offers a possibility to transfect tumours resistant to viral infection [11, 12]. In this study, the electroporation of a non-permissive adenocarcinoma of the lung is compared to the adenoviral vector. The luciferase activity in C57Bl/6 mice muscle was compared when transfected with plasmid alone or with plasmid followed by electroporation at various voltage. As depicted on Fig 1 electroporation increased transfection to a maximum of 2 logs which was attained at 180 V/cm. There was no more enhancing effect when the voltage was lowered to 100 V/cm. It remained to be determined if the 2 log increase in transgene expression was enough to obtain high blood levels of a secreted transgenic protein. Therefore, plasmids encoding mhATF-BPTI or human endostatin were injected into the muscle with and without electroporation and the plasma level of the encoded protein was monitored. To verify that the injection had been properly performed, an equal amount of pAdapt Luc was added to the plasmid preparation and the mixture was injected in a separate group of animals. Both groups (with and without pLuc), showing similar expression levels of the secreted encoded protein were pooled. As shown in Fig 2 the injection of plasmid alone – pATF-BPTI or pEndostatin – did not lead to blood levels above the background. In contrast, plasmid injection followed by electroporation resulted in detectable blood levels of mhATF-BPTI (5 ng / ml) and of hEndostatin (25 ng / ml). These concentrations are however, far below what one can achieve with low dose adenovirus (109iu) injected intravenously which results in protein production by the liver. Enhancement of plasmid expression in muscle by electroporation as a function of voltage. Luciferase expression in gastrocnemius muscle of C57BL/6 mice after injection of 50 μg pAdapt Luc followed by electroporation (black bars), injection of 50 μg pAdapt Luc (striped bar), and injection of saline (white bar). The luciferase activity was determined 2 days after the treatment. The values show the mean of three separate experiments. Data are expressed as means ± SD. Blood concentrations achieved by muscle electroporation. Endostatin and mhATF-BPTI plasma levels (red lines) and muscle luciferase activity (black lines) in C57BL/6 mice. The animals were sacrificed 4, 7, and 14 days after treatment to determine the luciferase activity in the injected muscle and plasma levels of endostatin or ATF-BPTI. Five animals per group and data are expressed as means ± SD. A: the mice received 50 μg pAdapt hEndo +/- 50 μg pAdapt Luc intramuscularly followed by no electroporation (circles) or by a 200 V/cm pulse delivery (squares). B: the mice received pAdapt mhATF-BPTI +/- 50 μg pAdapt Luc intramuscularly followed by no electroporation (circles) or by a 200 V/cm pulse delivery (squares). The plasma levels of mhATF-BPTI injected without electroporation were below the detection limit. The injection of two plasmids together did not influence the level of expression of either the luciferase plasmid or that of the plasmid encoding mhATF-BPTI or endostatin. The volume of injection limits the quantity of adenovirus or plasmid that can be injected into the gastrocnemius of a mouse without overflow. The maximal volume of 50 μL and the highest concentrations of the available batches of either recombinant adenovirus (1010iu / 50 μl) or plasmid (50 μg / 50 μl) were employed to compare the two gene transfer methods. The following electroporation conditions i.e. 200 V/cm, 8 pulses of 20 ms at a frequency of 1 Hz, were employed. The luciferase activity was measured in the gastrocnemius muscle of C57BL/6 mice 2 days after the gene delivery. As depicted on figure 3 transgene expression was roughly the same with adenoviral vector as with plasmid electroporation. The leakage of adenovirus out of the muscle induces a significant luciferase activity in the liver and in the spleen. This level corresponds to an intravenous virus dose that is far below that found to be toxic for the liver. 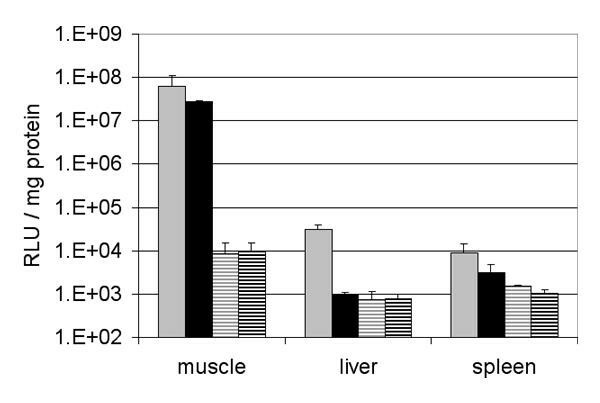 In contrast, the electroporation of the muscle was not accompanied by any transgene expression in the liver but a few mice showed a very low luciferase activity in the spleen. It is noteworthy that the background of luciferase is higher in the muscle than in the liver. This was always observed and considered to be inherent to the detection method. To further investigate the secretion capacity of the muscle, 1010iu Ad Adapt mhAB were injected in the gastrocnemius of mice. The plasma levels of mhAB, monitored for 3 weeks after the injection, showed a peak at 10 ± 4 ng /ml on day 10 after administration. In view of the variation, transduction of the muscle with first generation Ad 5 is not significantly more efficient that with electroporation. Adenoviral and electroporation gene transfer into the muscle. Luciferase expression in gastrocnemius muscle, liver and spleen of C57BL/6 mice after intra-muscular injection of 1010iu Ad Adapt Luc (grey bars, n = 5), 50 μg pAdapt Luc followed by a 200 V/cm electroporation (black bars, n = 6), 1010iu Ad Adapt Empty (gray striped bars, n = 3), and 50 μg pAdapt empty followed by a 200 V/cm electroporation (black striped bars, n = 4). The luciferase activity was determined 2 days after injection. Data are expressed as means ± SD. 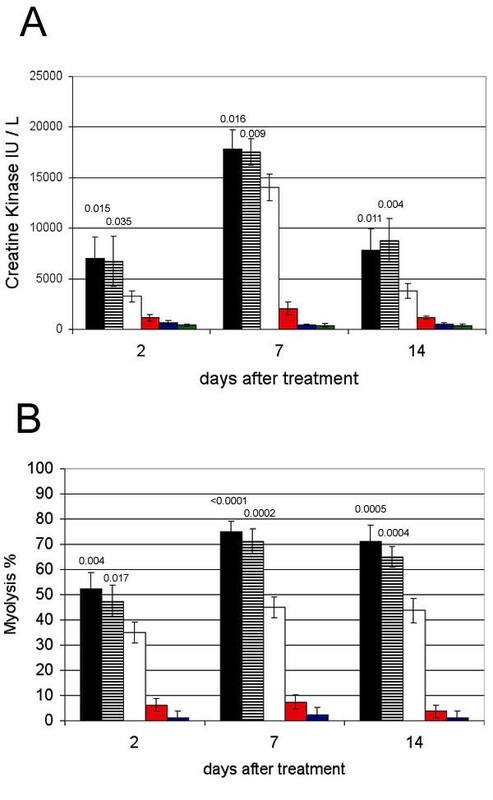 The damage induced by the electroporation was assessed by clinical observation, histological examination of muscle sections, and determination of creatine kinase in the plasma. Clinical symptoms were not observed in any of the mice during the observation period of 2 weeks. At autopsy, practiced 2, 7 and 14 days after the electroporation, macroscopic examination of the treated areas showed local abnormalities and an oedema of the whole gastrocnemius muscle. On day 2 the muscles were just a bit pale whereas at day 7 and 14 the site of electroporation was white / creamy and felt hard upon palpation (fig 4). Microscopic examination revealed severe muscle necrosis (fig 5) that was accompanied by a severe polynuclear eosinophilic and mast cell infiltration. The quantification of the pathological changes was assessed by determining the percentage of necrotic fibers on transversal sections of the muscle at the site of electroporation as well as by measuring the creatine kinase (CK) concentration in the blood. Histological scoring confirmed that the muscle damage was maximal at 7 days after the electroporation (Fig 6). Since the creatine kinase levels are not decreasing within the first week after electroporation, the muscle lesions must have continued over several days. In contrast, after an acute muscle injury like an ischemic infarction, the peak of CK occurs within few hours. This first peak may have occurred after the electroporation but was not monitored. Thus the elevation of the CK between day 7 and 14, probably reflect the slow necrosis of the muscle fiber occurring during the first week. More importantly, the electric pulse delivery caused on its own a severe rhabdomyolysis and the prior injection of saline significantly increased the muscle damage, but the addition of naked DNA did not influence the muscle injury. Macroscopic change of the muscle after electroporation. The gastrocnemius muscle of two C57BL/6 mice, 7 days after injection of 50 μg pAdapt Empty followed by a 200 V/cm electric pulse delivery. The arrows indicate the whitish part of the muscle corresponding to fibre necrosis and inflammatory infiltrate seen under magnification. Pathological changes of the muscle after electroporation. The photographs show representative histological sections of the gastrocnemius of C57BL/6 mice. Magnification ×100. A1-3: different sections at 7 days after plasmid electroporation (200 v / cm). The sections were performed in the middle of the white lesion seen macroscopically. They reveal a severe rhabdomyolysis and infiltration by mast cells, eosinophils and mononuclear cells. At the periphery of the lesion, the damages were less severe, the myocytes were not completely necrotic but were pale. In the part of the muscle that was macroscopically normal, there was only a diffuse mild to moderate inflammatory infiltrate. The black arrows indicate necrosis and white arrows indicate inflammatory infiltrate. B: muscle section of a healthy mouse. Quantification of muscle damage over time. The gastrocnemius muscle was injected with 50 μL (1 μg / μL) of pAdapt Empty followed by a 200 V/cm electric pulse delivery (black bars), 50 μL of PBS and 200 v/cm electroporation (striped bars), electroporation alone (white bars), 50 μL pAdapt Empty (red bars), 50 μL of PBS (blue bars), or were not treated (grey bars). The muscle and blood were collected 2, 7, and 14 days after treatment. Four animals per group. Data are expressed as means ± SD. A: Creatine kinase plasma levels. B: percentage of necrotic fibers determined in the electroporated part of the muscle. Statistical analysis (Scheffe's test) showed a significant difference of the muscle damage at day 2, 7 and 14 between the mice treated by electroporation without pre-injection and those pre-injected with PBS or plasmid and then treated with electroporation. There is not a significantly different damage between the muscle pre injected with PBS and the muscle pre injected with plasmid prior to the electroporation. The p values between the pre injected groups (with PBS or with plasmid) and the "electroporation only" group are indicated above the bars. Other investigators showed that protein expression from injected DNA was correlated with the voltage intensity up to 250 v/cm. 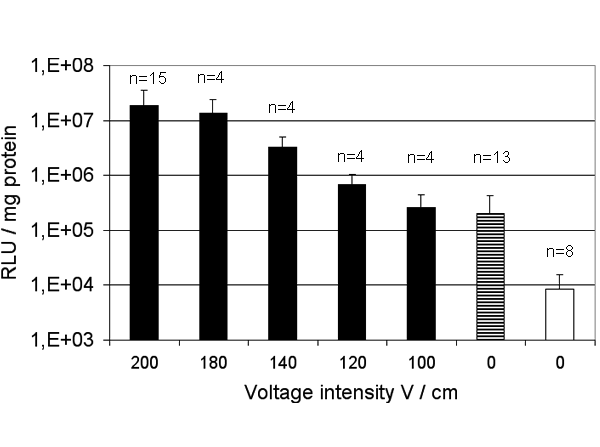 Thus, to determine a therapeutic window for the electroporation procedure, the voltage intensity was gradually diminished and the corresponding muscle damage assessed as previously (Fig 7). The degree of necrosis was indeed correlated with the voltage intensity and decreased to background at 50–100 V /cm. Unfortunately the luciferase expression levels decreased as fast as the muscle damage, and no therapeutic window could be found with these settings. 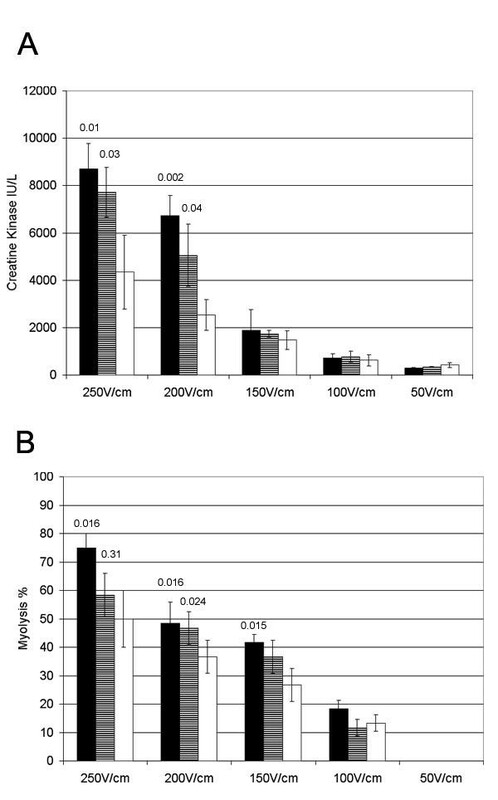 Quantification of muscle damage by electroporation using different voltage. The gastrocnemius muscle was injected with 50 μL (1 μg / μL) of pAdapt Empty (black bars), or 50 μL of PBS (striped bars) followed by the electric pulse delivery. The control mice received only the electric pulse delivery (white bars). The muscle and blood were collected 2 days after treatment. Four animals per group. Data are expressed as means ± SD. A: plasma levels of the Creatine kinase. B: percentage of necrotic fibers determined in the electroporated part of the muscle. Statistical analysis (Scheffe's test) showed a significant difference of the muscle damage at the highest voltage (200 and 250 V/cm) between the mice treated by electroporation without pre-injection and those pre-injected with PBS or plasmid and then treated with electroporation. There is not a significantly different damage between the muscle pre injected with PBS and the muscle pre injected with plasmid prior to the electroporation. The p values between the pre injected groups (with PBS or with plasmid) and the "electroporation only" group are indicated above the bars. The permissiveness to adenoviral vectors of rodent as well as of human tumours varies within a range of 3 logs. One of the reasons is that viral vectors are dependant on membrane receptors to enter the cells. Adenoviral transfection can be dramatically impaired in tumours that lack the appropriate receptors. Therefore, transfection of naked DNA using electroporation might offer a possibility to transfect adenoviral-resistant tumours. The L44 bronchial adenocarcinoma was selected from among ten rat tumours of different histological origin, as being very poorly permissive to adenovirus. The standard plasmid electroporation was compared to adenoviral gene delivery in subcutaneously growing tumours. As depicted on fig 8 the electroporation of 50 μg pAdapt Luc and the injection of 5.109iu Ad Adapt Luc induce roughly similar luciferase expression. However, a non-negligible proportion of adenoviruses leaks out of the tumour and reaches the liver. Such leakage is 600 times higher with intra tumoral delivery than after intra-muscular injection as judged by the luciferase activity measured in the liver. In contrast, there is no leakage of the luciferase activity from the tumour after plasmid electroporation. In order to assess the toxicity associated with the viral leakage to the liver, graded doses of luciferase and empty vectors were injected iv in Brown Norway rats. The intravenous route was chosen on basis of its consistent reproducibility. The luciferase activity in the liver was measured and pathological changes were scored in liver sections. To avoid interference by the transgene, the liver damage were determined in animals injected with an empty vector. 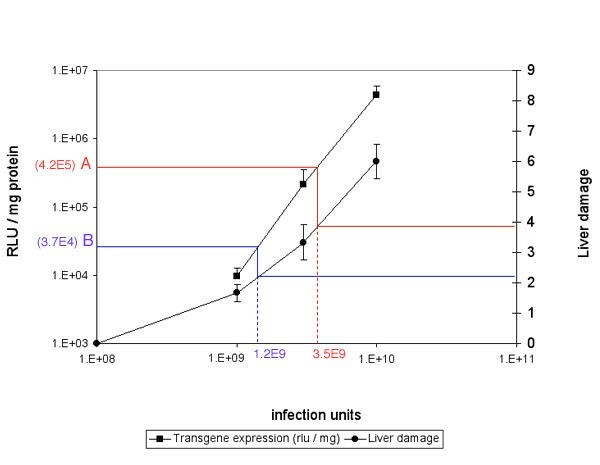 Figure 9 shows that the leakage associated with the intra-tumoral injection of 5.109iu and 1010iu is in the range of vector doses that induce a mild to moderate liver damage. In an attempt to assess the therapeutic window of the adenoviral vector in this poorly permissive tumour, the number of transduced cells in the tumour was determined by injection of vectors encoding the β-galactosidase gene (Table 1). It is assumed that no significant effect is expected from a therapeutic transgene (e.g thymidin kinase, mhATF-BPTI or endostatin) if the percentage of transduced tumour tissue is below 5%. The intra tumoral injection of 1010iu adenovirus resulted in the transduction of only 1–2% of the tumour cells, mostly limited around the needle track (Table 1). This vector dose of 1010iu is already toxic for the liver (Fig. 9). Thus the margin between efficacy and toxicity of the adenovirus in non-permissive tumour is not wide enough for therapeutic applications. Gene transfer in the L44 tumour and leakage to the liver. 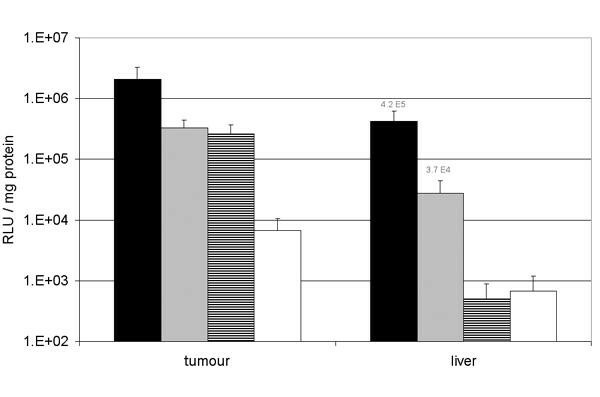 Luciferase activity in the L44 tumour and in the liver of Brown Norway rats after intra tumoral injection of 1010iu Ad Adapt Luc (black bars, n = 4), 5.109iu Ad Adapt Luc (grey bars, n = 4), 50 μg pAdapt Luc followed by a 200 V/cm electroporation (striped bars, n = 4), or 50 μg pAdapt Luc (white bars, n = 3). The luciferase activity was determined 2 days after the treatment. Data are expressed as means ± SD. Liver damage in relation with the dose of adenoviral vectors. On the left Y axis is plotted the luciferase activity measured in the liver of Brown Norway rats 2 days after iv injection of graded doses of Ad Adapt Luc (squares). On the right Y axis is plotted the liver damage score observed 7 days after iv injection of graded doses of Ad Adapt Empty (circles). The vp / iu ratio of both vectors were similar. Therefore, for a given luciferase activity in the liver, one can read on the graph the corresponding liver damage (the bleu and red lines). The values A (bleu) and B (red) are the luciferase activity in the liver after the intratumoral injection of 1010iu and 5.109iu Ad adapt Luc respectively (see figure 8). The value A and B correspond to intravenous doses of 3.5 109iu and 1.2 109iu respectively. These doses induce a liver damage score between 2 and 4 (circle line). Percentage of cells expressing β-Galactosidase after intra-tumoral injection of Ad5 Adapt LacZ. The percentage of stained cells was determined on 25 × magnification field of a tumour section. Four sections per tumour. Data are expressed as mean ± SD. Several investigators have used electroporation procedures to increase the gene expression of naked DNA injected in rodents muscles or in tumours [13, 14]. There are basically two types of muscle electroporation protocols: (1) high voltage / short pulses and (2) low voltage / long pulses. The highest plasma levels of an encoded protein were obtained with low voltage (200 V /cm) long pulses (20 ms) and 8 pulses at a frequency of 1 Hz, i.e. the blood concentration of human secreted alkaline phosphatase reached values around 2 μg / ml . The plasmid preparations described by others are most of the time endotoxin free and the transgene is under a CMV promoter without any nuclear transport signal. Using these settings and the BTX electroporation device, the transgene expression after intra muscular plasmid injection could be enhanced by a factor 100. This led to plasma serum levels of endostatin around 10 – 50 ng /ml. The dose of plasmid per injected muscle could not be easily increased for technical reasons. Given the maximal achievable plasmid concentration, the injection volume would have become too large for the muscle. Bettan et al. have shown that increasing the dose from 30 μg to 300 μg by multiple injections resulted in 7 to 10 fold higher plasma levels. Thus, the intra muscular injection of naked DNA followed by electroporation is considered by some as a means to obtain therapeutic plasma levels of proteins. However this range of plasma concentration can also be achieved by intramuscular or systemic administration of first generation Ad5 vectors. The toxicity of these vectors is well documented [6, 5]. Systemic delivery of adenovirus vectors induces mild liver damage at low dose (109iu in mice) and severe hepatitis and bone marrow necrosis at high dose (1011iu in a mice). Intramuscular injection of 1010iu induces moderate local inflammation . However, the local and systemic toxicity of the adenoviruses can be dramatically reduced by using gutless viruses . Notably, we observed severe muscle damage after the electric pulse delivery, which was worsened by the pre injection of saline but was not influenced by the presence of plasmid. Most authors dealing with electroporation gene transfer did not investigate the toxicity of electroporation. All differences between those published protocols and our parameters were tested to verify if they were responsible for the toxicity observed in our hands, but that was not the case. Similar damage occurred after using a simple anaesthesia (hypnorm) or in combination with muscle relaxants during electroporation. Different positions of the leg between the electrodes were tested with no influence on the toxicity. No difference in muscle damage was observed between male and female mice. The influence of the type of electrodes-needle or calliper – was not tested in our experiments. However, there are indications from previous publications that both electrodes would induce similar muscle damage. Indeed, Gehl et al. established that the toxicity of electroporation was correlated with the degree of cell permeabilisation  and that these was similar when using needles or calliper . Thus, it may be assumed that the electrode type is not of crucial influence on the toxicity induced by the electroporation. Therefore we conclude that the rhabdomyolysis developed in those mice was not influenced by other parameters than the electric pulse settings and the pre-injection of buffer. Only two investigators have reported muscle damage after plasmid electroporation. Mathiesen described muscle necrosis after plasmid electroporation that increased with the cumulative duration of the pulses and that the necrotic fibers never expressed the reporter gene. Hartikka et al. attributed the muscle necrosis to the presence of plasmid, but this conclusion is difficult to interpret since the elevation of serum CPK was not influenced by the plasmid. The lesions described by these authors and us have much in common with those induced by electrocution chocks. For instance, Block et al. , in an attempt to mimic non-thermally mediated muscle injury in electrical trauma, used similar electric field strength and pulse length as for plasmid electroporation. This resulted in quantitatively and qualitatively very similar muscle damage to what we found with the electroporation procedure. Thus, there is strong evidence that muscle electroporation, as it usually performed, is severely damaging and reduces plasmid expression to the survival cells. Furthermore, even if electrical injuries generally involve much higher field strength , it is noteworthy that some pathologic changes found after electric shock resemble the one observed in muscle after electroporation i.e. the decolouration in bands of the muscle fibbers described by Morita et al. .
Bureau et al. have made attempts to improve the electroporation protocol by introducing new settings, consisting in the combination of high voltage and low voltages pulses, that are inducing less permeabilisation of the myocytes . Even if these combined protocols seems to be slightly less toxic, there is still much improvement needed to compete with the new generations of adenoviral vectors as a method to transfect muscle in patients. In contrast to intramuscular delivery, the electroporation of tumours seems to offer a wider therapeutic window. In case of tumours that are poorly permissive to adenovirus, it is difficult to transduce a large number of tumour cells with adenoviral vectors without inducing severe liver damage. In contrast, the systemic toxicity is not a risk with plasmid electroporation as it is with adenoviral transfection. The possible damage induced by the electroporation could not be easily determined due to the high background of necrosis in the tumour tissue, but if it occurs it could only add to the therapeutic effect. In our experiments the concentration of plasmid preparations limited the maximal dose that could be delivered into the tumour, but If this technical obstacle of producing highly concentrated plasmid was solved, electroporation would offer an applicable transfection technique for viral-resistant tumours that are accessible with an electroporation device i.e. head and neck or skin cancers. Pathogen-free inbred male C57Bl/6 mice, weighing 20 to 30 gr and Brown Norway rats, weighing 300 to 350 gr were purchased from Harlan, The Netherlands. All animals were fed ad libitum with laboratory chow and water and were kept under standard laboratory conditions. For assay of plasma creatin phosphokinase (CPK), hEndostatin, and mhATF-BPTI, mice were anaesthetised with isoflurane, bled by tail vein cut and the blood was collected in EDTA tubes. All animal procedures were performed in accordance with the official guidelines after obtaining permission of the animal welfare committee. Measurements of CPK were performed according to standard clinical procedures. The plasmid pAdapt Luc, pAdpat LacZ, pAdapt hEndo and pAdapt mhAB encoding respectively for the luciferase, β-galactosidase, human endostatine and murinised human ATF-BPTI genes were constructed as described previously . The different genes are under the control of the cytomegalovirus (CMV) immediate-early promotor and terminated by the simian virus (SV40) late poly(A) signal. The p Adapt mhAB encodes for a murinised form of the human ATF-BPTI (mhAB) . In this construct the mhATF-BPTI, is preceded by the native secretion signal peptide of the human urokinase. The human endostatin coding sequence (InvivoGen, CA, USA) was cloned in the Ad Adapt shuttle vector. The encoded endostatin corresponds to the 183 residue of the human endostatin described by O'Reilly et al. (1997) with an intact N-terminus (HSHRDFQ...), preceded by the secretion signal peptide of the human IL-2. The p Adapt empty is identical to p Adapt Luc except that it does not encode any transgene. All plasmid DNA preparations were prepared using Qiagen Mega Kits and purified using ENDOfree kits (Qiagen, Valancia, CA). Recombinant adenovirus vectors were generated in PER.C6™ cells by homologous recombination between an adapter plasmid (pAdapt) and the E1 deleted Ad 5 DNA plasmid as described elsewhere . As a result of the absence of sequence overlap between the Adapt plasmid and the Ad5 E1 sequences integrated into the genome of PER.C6, the vector stocks used in this study did not contain replicative competent adenovirus (RCA) . All vectors were produced on PER.C6™ using standard procedures . Infectious units (iu)/ml were determined by end point cytopathogenic effect (CPE) assay on 911 cells . Viral particles were determined by HPLC . The particle to infectious unit ratio was always lower than 5. The animals were anaesthetised by intra peritoneal injection of fentanyl / fluanisone (Hypnorm, Janssen Animal Health, The Netherlands). Rear legs and the flank skin were shaved for the muscle and tumoral electroporation respectively. Fifty microliter of plasmid (50 μg) or of adenovirus (1010iu) were injected slowly to prevent back flow in the gastrocnemius with a 29 Gauge needle. When 2 plasmids were injected simultaneously, the volume of the mixture was 100 μl. The tumours had a volume of 500 cm3 and the injection volume was 100 μl. Two minutes after plasmid injection, transcutaneous electric pulses were applied through two stainless steel plate electrodes of a dimension of 5 × 10 mm (BTX, calliper electrodes; Westburg, The Netherlands) placed on each side of the leg or the tumour. Electrode jelly was used on the electrode plates to ensure good electrical contact. The distance between the electrodes were usually around 5–6 mm. The electrodes were applied on the muscle until they came in complete contact with the skin, but without compressing the muscle. Eight 20-ms pulses were delivered at a frequency of 1 Hz using a BTX ECM 830 electroporator. Variation between 50 and 200 V /cm were investigated in different experiments. Mice were sacrificed by an overdose of isoflurane and whole organs were dissected out, frozen in liquid nitrogen and stored at -80°C. Organs were homogenised in phosphate buffered saline pH 7.8 using a blender. To lyse the cells, DTT (SIGMA, The Netherlands) (1 mM) and Triton x-100 (0.1%) (Merck, The Netherlands) were added. After centrifugation at 10,000 rpm for 10 min, 20 μl of the supernatant was added to 100 μl of luciferase assay substrate (Promega, The Netherlands). Relative light units (RLU) were determined for 30 s using a luminometer (Lumat 951, Wallac, Belgium). The amount of protein in the extracts was determined with a commercial kit (Bio-Rad laboratories, The Netherlands) based on the Coomasie brilliant blue G250 binding assay . The level of luciferase activity in the tissue homogenates was expressed in RLU / mg protein. The mhATF-BPTI ELISA was developed by P. Quax et al. (TNO-Prevention and Health, Leiden The Netherlands), using a monoclonal antibody specific for the ATF as the capture antibody and a polyclonal antibody directed against BPTI as the detector antibody . As a standard we used either urokinase or mhATF-BPTI. The levels of human endostatin in mice plasma were determined with an ELISA kit (InvivoGen, CA USA) according to the manufacturer procedure. The L44 adenocarcinoma was induced in Brown Norway rats by local irradiation of the thorax . The L44 carcinoma was serially passaged on syngeneic rats. For the experiments, the tumours were established in the flank of rats by implanting small pieces (3 × 3 × 3 mm) of tumour tissue sub-cutaneously as described before . Forty-eight hours after Ad5 Adapt LacZ administration rats were sacrificed and tumours were removed and cut in 2 mm sections. Sections were fixed in 10% phosphate buffered formalin (pH 7.0) for 60 min at room temperature and incubated overnight in 0.5 M sucrose. The samples were subsequently frozen in liquid nitrogen. Ten μm thick frozen sections were prepared and stained with 5-bromo-4-chloro-3-indolyl-β-galactopyranoside (X-gal) solution (Molecular Probes, The Netherlands) overnight at 37°C. Finally, sections were counterstained with haematoxylin and eosin. The percentage of transduced cells in an histological section was assessed by the surface of stained cells divided by the whole section surface. Cells were considered positive when a blue staining was seen in the nucleus. The surface of stained cells in each section was determined on digitalised photographs of 25 × magnification fields. The surface measurements were performed with the NIH Image 1.62 software. The microscopic examination of the gastrocnemius was performed on paraffin section of formalin-fixated muscle. Ten transversal sections form one extremity to the other were performed and stained with haematoxylin and eosin. All sections were examined but the quantification of the rhabdomyolysis was determined on 3 sections, 1 mm apart from each other, cut through the part of the muscle that was electroporated. The percentage of necrotic fibers was quantified on photographs of 25 × magnification field. The surface of the necrotic areas was measured with the NHI image analyser software and reported to the total surface of the whole sections. The scoring of the liver damage was performed in Brown Norway rats 7 days after the intravenous injection of 1010iu Ad Adapt Empty. The liver pieces were fixed in formalin 10%, embedded in paraffin and sections of 10 μm were stained with haematoxylin and eosin. The total damage score is a compilation of scores of apoptosis, vacuolar changes, nuclear condensation, anisonucleosis, megalocytosis, mitosis, and inflammation. Normal control liver score is zero and the maximal is nine. We thank Dr Chris Zurcher for the scoring of the liver damage and Germaine Penders for her technical support.